Arne Duncan's Chicago Boys policies will continue to dominate the education policies of the Obama administration despite the growing body of evidence that the Race To The Top stuff is built on a foundation of lies, many of which began in Chicago while Obama was an Illinois State Senator and Arne Duncan the "Chief Executive Officer" of Chicago's public schools. In their positions in those days, both Obama and Duncan were loyal servants of Mayor Richard M. Daley and the Plutocracy behind the Daley administration.. . . . And now I would like to turn to a subject that all of us, including myself, love to talk about, even when we sometimes don’t understand exactly what we are saying — or at least don’t fully understand the implications of what we’re saying. The subject is education, and the state of the Union’s educational system is, well, not so great, if you live in one of the thousands of poor communities across our great land. In the leafier, middle class communities of America, things are pretty good. In fact, the most recent international test comparisons show that our middle class children are performing at or above the levels of children in other Western countries. That is why I want to spend a few minutes talking about how we can do better, particularly for that 20 percent, or that bottom quintile, of American children who now live in poverty, the same ones who are struggling against great odds with hopes of some day claiming a share of the American dream. For the past decade, at least, our national education policies have had mostly negative consequences for the children they were intended to help. No Child Left Behind with its unachievable test performance demands for both poor and non-poor has resulted in the early failures, the urban public school systems, being blown apart by sanctions that punish the children and the teachers and shut down their schools while doing little or nothing to bring resources to bear to change the awful poverty that is largely responsible for the weak academic performance in these schools. Now I am not saying this in order that we once again blame the poor for the effects of their poverty, but, rather, to point out the need now to take what we know about who is struggling and who is failing, to finally deliver on our promise to bring educational hope and change to those who haven’t had much of it in the recent, or distant, past. I am, therefore, ordering the Education Department to draft regulatory language that will freeze NCLB performance targets at their 2010 levels until a thorough evaluation of the current policy on testing and accountability can be undertaken. Toward that end, I am requesting the formation of a blue ribbon taskforce to be comprised of educators and educational leaders from K-12 and higher ed, education policy experts, representatives from both political parties, union representatives, and parent groups to come together, deliberate, and to make recommendations toward actionable legislation for the long overdue reauthorization of the Elementary and Secondary Education Act that, henceforth, will be known as the Education Debt Repayment Act (EDRA). When Arne Duncan brings his children into his public pronouncements, he ignores the fact that they are attending school in suburban Virginia and not in Washington, D.C., where President Barack Obama sends his daughters to an expensive private school because he doesn't believe in supporting public education and hasn't since his days in Chicago as a University of Chicago law professor, Illinois State Senator, and then United States Senator.An education suitable for a hopeful future for all American children cannot be sustained by practices from a past that is better left behind. The practices of segregation and apartheid in America should hold no attraction for us, and yet our federal policies have urged us back in that direction, particularly with the encouragement of widespread charter schools. With zero tolerance charter schools as the only choice to weak public schools for poor parents, most middle class parents would not and will not send their children to these schools because they are so severe. On the other hand, we have the high-flying charter schools in white suburbs that do not provide public transportation or lunches for that poor children would need if they could be enrolled in them. In either case, the result is increased segregation. Too, these segregating charters often drain tax dollars away from public schools that could use those funds for renewal, restoration, and renovation during these hard economic times, when the best research tells us that less than 20 percent of charter schools are doing better than the struggling regular public schools they are replacing. Therefore, I am declaring a moratorium on federal funding for all new charter schools until the Institute of Educational Science and the Government Accounting Office can complete a thorough review of charter school benefits, costs, and overall effects on America’s public schools. At the same time, I am directing the Secretary of Education to devise clear guidelines for generous grant funding for any school, school system, or consortium to put in place programs to challenge the re-segregation trends in America’s schools today and in the future by creating new magnet school initiatives or by initiating or improving programs based on socioeconomic diversity with public school choice. 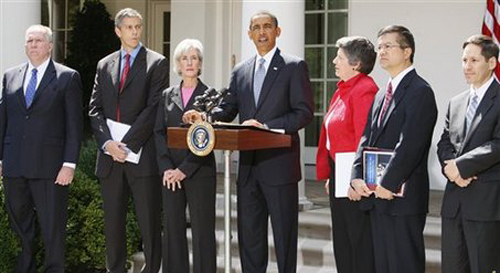 Barack Obama with education officials. The State of the Union speech will reinforce the myths, lies, and fictions that the Obama administration has used to undermine public education and promote Race To The Top.Finally, I want to announce a new initiative regarding teacher quality. Just as we cannot afford, either morally or economically, to return to an America that had segregated schools, we cannot turn our backs on our commitment to the most important and, of late, the most vilified of professions. I am speaking, of course, of teachers, who are daily in charge of that precious 20 percent of our population that constitute 100 percent of our future. Since the days of Horace Mann and the Common School Crusade, school reformers have pushed for more qualified and better-educated teachers. But in recent years, those standards for entering the profession, which were often weak already, have been weakened further by lowering requirements or by encouraging a Peace Corps approach to teacher recruitment in poor areas. While we applaud those enthusiastic new graduates who sign up to teach two years in the hardest to staff schools, this is not enough for a country that believes that hope for a professionally-trained teacher and a quality public school should not be limited by one’s zip code. In order to make sure that every child in America’s public education system has a professionally prepared and highly-qualified teacher, I am announcing a new program to attract, recruit, and train this generation’s best and brightest college graduates who have the desire, character, intellect, and disposition to become teachers in America’s most challenging learning environments. Under this new initiative, college graduates with liberal arts and science majors may apply for Teach America Grants (TAG). These grants will pay for post-graduate training at the level of Masters in Education and Teaching (MET), while paying a stipend for living expenses until TAG graduates find suitable employment in schools with America’s lowest-achieving children. I am requesting that Congress authorize $1.6 billion per year for the next five years to educate the first 100,000 TAG teachers. 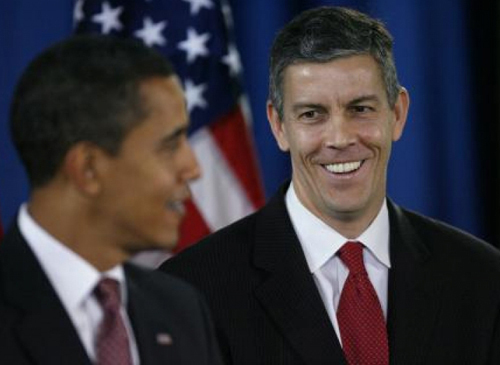 Barack Obama with education officials. The State of the Union speech will reinforce the myths, lies, and fictions that the Obama administration has used to undermine public education and promote Race To The Top.Now with such an investment in making available the best and brightest teachers in poor schools, we cannot afford to leave these communities in disrepair from generations of malignant neglect. We cannot afford for the conditions of poverty to burn out and burn up our investments in educational hope and change. Because we know that when poverty and the effects of poverty are reduced, so will the schools in those communities improve if programs and teachers are put in place to coincide with those community changes, my Administration is announcing the creation of a new paradigm for educational policy. We are transitioning, then, from policies aimed at creating magnet schools, even though they can be helpful in the short term, to a new policy of creating magnet communities. These new magnet communities will attract diverse job opportunities and diverse populations to work, to live, to rebuild, and to restore the poorest areas of our cities. That is why I am directing the Secretaries for Health and Human Services, Housing and Urban Development, Labor, and Transportation, to appoint representatives at the Assistant Secretary level to participate fully in the EDRA Taskforce deliberations, with authorization to bring to bear the full resources of their departments in crafting an education policy that treats the learning problem of the poor as not only a school problem, but as a jobs problem, a housing problem, a transportation problem, and a health problem. Until these problems are addressed with the appropriate resources required to do so effectively, the education debt that we owe to every parent with a child in a poor school cannot be paid. And until that debt is paid, it is the President and Congress that must be held accountable by the American people. The old saying of “No Excuses” will no longer serve as an excuse for doing nothing to improve the desperate lives of the working poor and their children, who deserve an education that can sustain the hope that we as adults urge upon them. These efforts to rethink and renew our commitments to quality public schools for all children follow a tradition that began over 200 years ago with Noah Webster and Thomas Jefferson. The future of our democratic and economic aspirations as a free people rests upon a well-educated citizenry, and that that can only happen as a result of equal opportunity being extended to all children, rather than the best opportunities for some with the worst for others. These educational changes that I am announcing tonight represent a new beginning for the restoration of a national commitment to educational equity and excellence for all. A free people demand nothing less, for as Jefferson still reminds us, "if a nation expects to be ignorant and free, in a state of civilization, it expects what never was and never will be." Although he mentions 1.5 billion for education and TAG money, NOWHERE did he concern himself with the degrading and disgusting continuation of the firing and reduction in status of Highly Qualified Educators. The current policy is to get rid of highly qualified teachers for new teachers that cost less. That is not the solution. FUNDING to local Union teacher schools needs to be increased so that the teachers have the tools to teach more effectively. Books for instance, computers for teachers and classrooms, funds for buses for educational field trips, etc. The problem is NOT the teachers. The problem is the FUNDING of Education. If only. So fun to be reading your fantasy State of the Union Address the very night before the real BIG event. You have actually suggested some excellent solutions in your "if only" blog. Once we take our schools back from Gates, Rhee and the feds, we need to be ready with solutions like these.